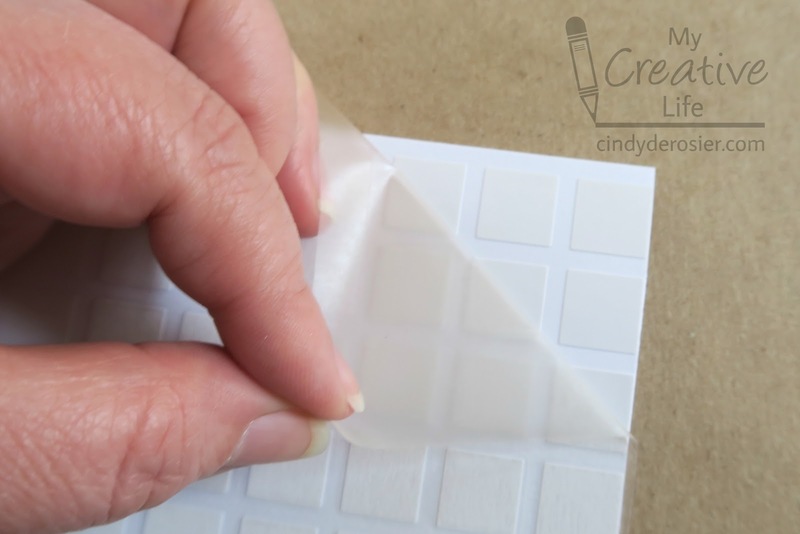 Cindy deRosier: My Creative Life: StickTogether Sticker Background Cards... and a Winner! Last week, I showed you a pixelated rabbit craft I made from the leftover stickers from a StickTogether kit. Today, I'm sharing quick and easy cards, also made with leftover stickers. Can you guess how I lined up the stickers so perfectly? Read on to find out! There are affiliate links throughout this post. 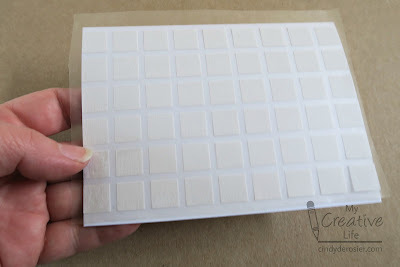 Cut and score the cardstock to make a card base of your desired size. Select your desired color of stickers. 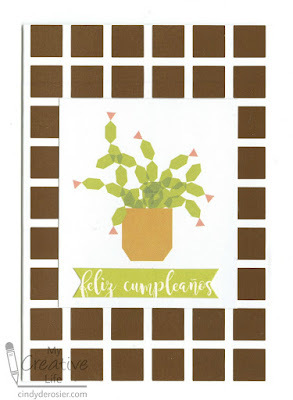 I used brown in the 'Feliz Cumpleaños' example above and white for the 'Birthday Wishes' card. Cut a piece of clear contact paper that is the same size as your card base. Remove the protective sheet to reveal the film. Place the film sticky side down over the top of the leftover StickTogether stickers. Press on the contact paper to adhere it to the tops of the stickers. Flip the stickers upside down and carefully pull away the original backing. The stickers will stay on the contact paper. Now carefully line up the stickers on the card base, with the sticky side touching the cardstock. Press across each sticker to ensure good adhesion. Carefully peel up the contact paper. The stickers will stay behind on the card base, lined up in perfect rows. 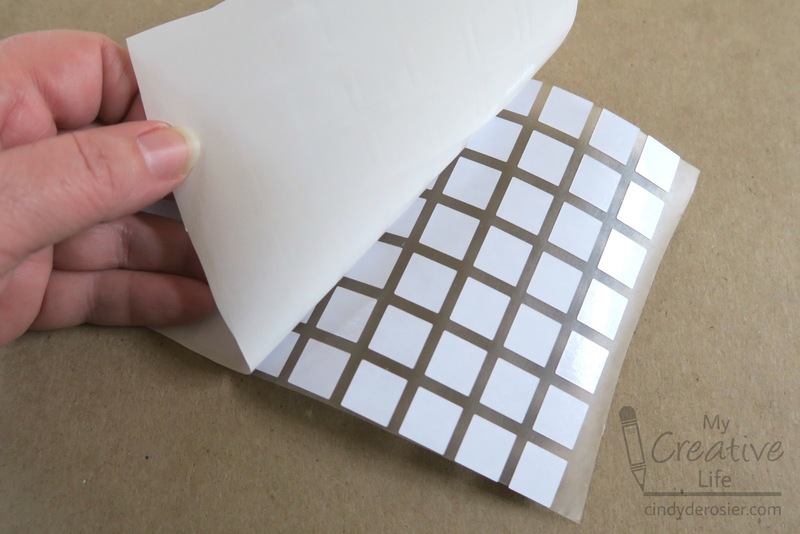 Reattach the liner to the piece of contact paper; you can reuse it many times. 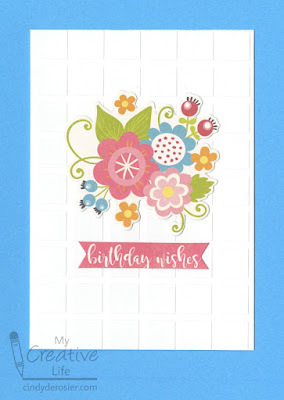 Finally, add an image and a sentiment to the card, centering it directly on the sticker background. Isn't that cool?! StickTogether kits come with tons of extra stickers, so you can make quite a few card backgrounds using this technique. But that's not all you can do with the stickers. I'll be sharing two more ideas next week! Time to announce the winner of the StickTogether kit. Congrats, Julie! The hot air balloon kit from StickTogether will be on its way to you soon! Whoo-to-the-hoo! Yay, Congrats Julie, enjoy!!! OMYGOSH!!! That's ME!!!!!! Thank you soooooo much!! WOW!!!!! I love love love those cards! LOVING how you did the grid!!! !